Home 4G-Services BSNL-Alert-Message Mobile PUBILC AWARENESS Public Grievance Cell SIM OFFERS BSNL 4G Express SIM launched across India Offering One Year Free 4G data usage, Voice calls and SMS? 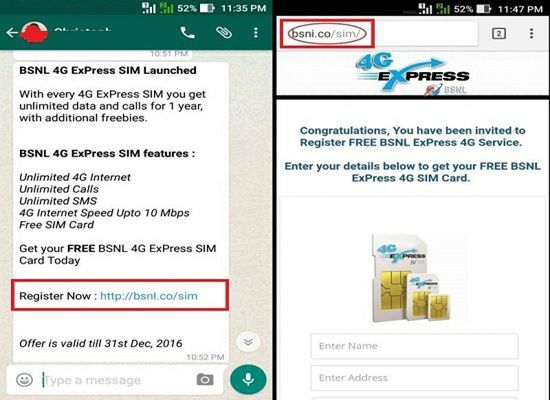 BSNL 4G Express SIM launched across India Offering One Year Free 4G data usage, Voice calls and SMS? High-speed internet service provider to compete with Reliance Jio (RJIL) BSNL has announced the launch of ‘4G Express SIM’ in all telecom circles? 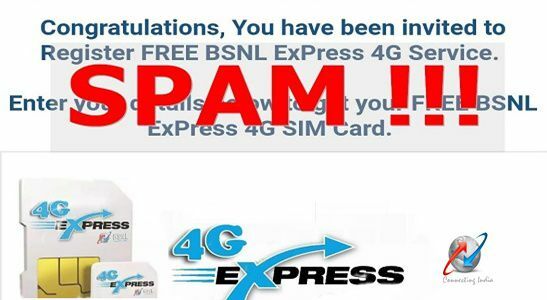 State run Telecom Company Bharat Sanchar Nigam Limited (BSNL) responded on these type of messages circulated on Social Media websites and Chatting messengers like Whatsapp that reads ‘One Year Free 4G Data usage, voice calls, SMS offering with BSNL 4G Express SIM’ launched across India. 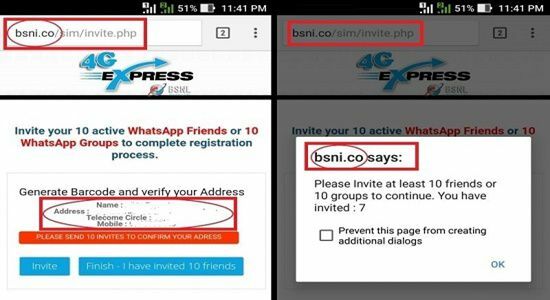 As per latest information, BSNL Competent authority has declared that ‘Customers are advised not to click on the link provided for registration nor attract to this message’ circulating on social media especially moving on Whatsapp very fast. This SPAM message claims that BSNL Unlimited 4G internet with speed upto 10Mbps offering through newly launched 4G Express SIM and offer valid till 31st December, 2016. Those who want to register for BSNL 4G Express SIM they can click on link provided as below to apply online and generate a bar code. Actually this link message does not redirect you to BSNL Official website. This spam link redirects to another site which is not related BSNL organization. If you closely examine the URL in the message the ‘L’ in ‘BSNL’ is a Capital ‘I’ , which takes you to the ‘bsni.co’ website. If customer attracted to this message and clicks on this URL you’ll be redirected to http://bsni.co/sim/’ or http://bsni.co/express/’ . There you’ll see the add for the 4G express SIM card and you’ll be asked to enter details such as name, address, phone number and state ect. Thereafter, you’ll be asked you to generate a bar code and verify your address, but in order to continue you should need to send the invitation to 10 more friends or groups on Whatsapp from your mobile phone. If you experienced and forwarded this message to 10 groups, the next screen asks you to install an app to verify the mobile number for authentication. The message also tells you not to Uninstall the app for three days and to allow the website at least 12 hours to verify the app installation. Hiting on the URL will redirect you to Google Play store and there you’ll be forced to install that spam mobile app. At last, customer will be fooled and you won’t and without any results you were duped. For this process you did not pay for anything, you’ve successfully sent the spammer all your details such as name, mobile number and address what you’ve submitted. Finally spammers would collect all your data and sell it to third party in the online market or marketing companies for a hefty sum. BSNL finally advised to all its users ‘This Fake news and website cleverly designed which will display ads, automatically redirects and force you to download mobile app’. DON’T become Victim to these fake messages, If you’ve any doubts Dial BSNL mobile services 1503. Don't forget to share your valuable feedback on our comment desk.